Report to Houston International Terminal by 9:00pm and proceed to the EVA Airlines ticketing counter for flight BR-51. Depart for Taipei and lose one day crossing the International Dateline. After a short layover in Taipei where we endure the Big Speech, we depart for Vietnam. We land at Noi Bai Airfield (heavily bombed during the American War) and proceed through immigration, retrieve our bags, clear customs, and board our waiting motorcoach. We then cross the Red River and its dikes to explore the Ha Noi environs. We visit the Hoa Lo Prison (Hanoi Hilton); the John McCain Monument; and the fascinating War Museum with its Dien Bien Phu exhibit and American artifacts. Tonight, we enjoy our Welcome Dinner. This morning we depart Hanoi for Ha Long City. On arrival, embark on a deluxe Bhaya Classic junk for overnight cruising on picturesque Ha Long Bay. This World Heritage Site is a spectacular seascape sculpted by nature. Our junk meanders between 2,000 majestic monoliths erupting from the sea. We fall asleep to hypnotic nautical night sounds in the comfort of our staterooms. Docking at noon, we disembark and return to Ha Noi. Tonight, we enjoy a visit (mission permitting) to the Marine House, home of the U.S. Marine Corps Security Guard responsible for the protection of the U.S. Ambassador and the American Embassy. This morning we visit the Ho Chi Minh Mausoleum, Ho Chi Minh House, and One Pillar Pagoda. We then head back to Noi Bai to catch our flight to Da Nang Airfield. Upon landing, we go to lunch and then stop for photos at My Khe Beach on the South China Sea. My Khe was better known as "China Beach," which was used as an in-country 'R&R' by U.S. troops. A little farther south we pass through the site of the Marble Mountain Air Facility, a U.S. helicopter base during the war. We will visit the Marble Mountain area and stop at a marble carving shop. This area is famous for their stone-sculpture industries. The mountains are visually-striking monoliths that rise from the flat coastal plain and are home to Buddhist shrines and numerous caves. We climb to the top of the largest mountain and explore the VC hospital area located deep within. Our last stop is a wood-carving and silk shop as we arrive in Hoi An. Hoi An, a beautiful well-preserved ancient trading port, is now a UNESCO World Heritage Site. Its temples and architecture show the different cultural influences of its time and its lovely Japanese covered bridge is unique to this town. Luckily for Hoi An, its importance waned long before the War, and it was left essentially isolated and relatively untouched. Today is a well-deserved free day. You can relax by the pool or you may want to roam by yourselves the streets and shops of this ancient port city, formerly known as Faifo, where Dutch, Portuguese, Chinese, and Japanese traders once walked. The town ceased to be an important trade harbor when its inlet shoaled and the port was moved north to Da Nang. Shopping is excellent here and is one of the best places for tailor-made clothing. There are literally hundreds of amazing little shops for your shopping pleasure. Lunch and dinner are on our own. Be sure to sample some of the many local restaurants and night spots in this fascinating little city. Very early this morning, we travel north on Highway 1. Our first stop is Red Beach II (where U.S. Marines made their first amphibious landing in March 1965). Continuing north we make our way up the breathtaking Hai Van Pass (Pass of the "High Clouds"), stopping at the top to take in a parting view of Da Nang and her Bay. Hai Van Pass has been a vital military strategic foothold for centuries, and was garrisoned by Chinese, French, Japanese, and U.S. armies. Bunkers and fortifications dot the hillsides. At the northern end of the Pass, we stop for photos at the fishing village of Lang Co. Continuing north, we pass by Dam Cau Hai, one of the largest lagoons in all of Southeast Asia encompassing 112 square kilometers. After lunch in Hue City, we venture farther north and come upon the My Chanh Bridge. It was here that the ARVN held the line against invading NVA forces during the 1972 Easter Offensive and from which they launched their counterattack to drive Ho's forces back toward the DMZ. North of here is the section of Highway 1 known as the 'Highway of Horror.' During the NVA's 1972 Easter Offensive, thousands of local refugees - most of which were old people, women, and children trying to flee south - were mercilessly slaughtered by communist NVA troops and artillery. The north side of the bridge is where the worst of the massacre occurred. Massive numbers of people were trapped because the downed bridge prevented escape. Soon thereafter we enter Quang Tri City where we stop at Long Hung Church, a Catholic Church in which ARVN troops sought refuge during the 1972 Easter Offensive invasion from the North and in which NVA troops sought refuge as they retreated during the ARVN counter-attack. The church has been left as it stood after the battle, with scars from grenades, rockets, and bullets. We also visit Bo De School, which provides a shocking and violent reality of the 'Battle of 81 Days and Nights' for the city and its Citadel. The battle is infamous for the huge amount of ordnance fired by both ARVN and NVA forces. We then cross the Quang Tri Bridge, passing the Ai Tu Airfield (Quang Tri Airbase), after which we walk the Dong Ha Bridge (destroyed by Capt. John Ripley which stopped the initial NVA advance during the 1972 Easter Offensive). We then travel east on the north side of the Song Bo Dieu and Song Cua Viet passing just north of the village of Dai Do, site of the Battle of Dong Ha fought by The Magnificent Bastards of 2/4 in May 1968. We continue east, passing significant military sites such as Mai Xa Chanh, My Loc, and Jones Creek. Turning north again, our route takes us along the Tonkin Gulf beach road. We cross the Song Ben Hai (the river that was the only true physical demarcation zone between the North and the South) into North Vietnam to explore the tunnel complex in the artillery village of Vinh Moc. The Vinh Moc Tunnels are an incredible complex of tunnels that were dug by local people to evade the constant U.S. counter-battery bombing of the area. The tunnels include kitchens, wells, and a 'hospital,' as well as living quarters for roughly 60 families. The tunnels, which are at a depth of 30m, are still in very good condition and saved the villagers' lives. After visiting them, we ride south again, returning over the Hien Luong Bridge (also known as the Peace Bridge), where there is a memorial to the victims of the war. Back on the southern side, we proceed to the FSB Gio Linh (Forward) which overlooks the DMZ from the American side. Leaving very early we head inland. Vietnam is a very long, thin country, and we traverse it today from the coast almost all the way to its border with Laos. We visit the U.S. base at Con Thien (the Hill of Angels), after which we stop for photos at the Cam Lo Bridge. Turning west on Route 9 we point out places of military importance during the war, including Camp Carroll, (the joint-forces artillery plateau), the Khe Gia Bridge, Vandergrift Combat Base (LZ Stud), Ca Lu, and the Hairpin. We stop at the Rockpile where we can take photos of it and the Razorback. Lunch will be in Khe Sanh Village prior to entering Khe Sanh Combat Base where we spend ample time exploring. Originally, the Khe Sanh base was a U.S. jungle outpost close to the border with Laos. The area grew into a major military base and airstrip under LBJ and was the scene of a 77-day siege in 1968, as well as many vicious hill battles in 1967-68. We then stop at Lang Vei Special Forces Camp, overrun in the first-ever NVA tank assault. Co Roc Mountain soars to the heavens just across the border. On our way back to Hue City (the old Imperial Capital of Vietnam), we stop at the Lew Puller School in Dong Ha. Today we begin our study of the 1968 Tet Offensive battle for the southern city. The Battle of Hue (1968) was one of the longest and bloodiest battles of the war, and we spend the remainder of the day visiting strategic sites around the city. We follow the actions of 1/1 and 2/5, covering, among others, the old Shell Gas Station, the Football Stadium, the former MACV Compound, Tran Cao Van Street, Joan of Arc Girl's High School, Hue University, Treasury, Public Health Building, Provincial Capital Building area, and the Church of the Redemptress. Famous for its university, this town, known for open and radical thinking, is also home to the high school that graduated Ho Chi Minh, General Giap, and President Diem. We then enjoy a relaxing Dragon Boat cruise up the beautiful Perfume River to the Thien Mu Pagoda. It was from this pagoda that in 1963 Monk Thich Quang Duc was driven to Saigon where he immolated himself in protest to the SVN government's oppressive treatment of the Buddhist people. After lunch, we enter the Citadel with its ramparts and towers, and visit sites specific to the northern battle, including the Chuck Meadows and Dong Ba Gates. We finish at the Imperial Palace gate blown by 1/5, which allowed the ARVN to enter and lower the NVA flag that had flown from the main flagpole for 24 days. Our battle study complete, we take some time to visit the Forbidden City, home to the ancient emperors. Tonight, dinner is on our own. You may want to grab a pizza or a burger at the DMZ Bar, just a short walk from our hotel. Very early this morning we fly from Phu Bai Airfield to Ho Chi Minh City's Tan Son Nhut Airport. Tan Son Nhut was once the busiest airport in the world. Departing the airport, we head into the center of the city (still called Saigon by most Vietnamese) and visit the War Remnants Museum; Reunification Hall (Old Presidential Palace); Norte Dame Cathedral; and the Old Post Office. We also drive past the former U.S. Embassy area which now houses the new U.S. Consulate. We rise early and head to Tay Ninh Province to visit the Cao Dai Holy See Temple and observe the Noon Ceremony. Simply stated, the Cao Dai covers all bases. Among their deities of worship are Christ, Buddha, and Confucius. Some minor saints are Sun Yat-Sen, Joan of Arc, and for some reason, Victor Hugo. After lunch, we explore the Cu Chi Tunnels, an underground labyrinth of some 75-miles combined. At least 43,000 enemy soldiers died defending this strategic maze of tunnels which contained supply depots, arms caches, training facilities, hospitals, and troop accommodations. This morning we travel south to the town of My Tho in the Mekong Delta where we take a boat trip on the Mekong River to visit Unicorn and Coconut Islands, local houses, and workshops. Back in Saigon, our last stop today is Cha Tam Church where South Vietnam President Diem had fled and disguised himself as a priest during the 1963 coup. It was from this place that Diem was captured, taken away, and assassinated. Twenty days later, U.S. President John F. Kennedy was assassinated. Some claim the two deaths were related. Today, our last full day in Vietnam, is a free day. You can take a walk to Ben Thanh Market or stroll along old Tu Do Street (now Dong Khoi Street) to explore a myriad of little shops where you can discover special gifts to bring home. Or simply sit and watch the world go by from one of the city's many caf�s. Lunch is on our own, but tonight all hands are required at our very special Farewell Dinner. After breakfast, we transfer to Tan Son Nhut Airfield for our flight to Taipei. Departing from Taipei we gain a day enroute to the continental United States by re-crossing the International Dateline, arriving in Houston at approximately 11:00 p.m. this same day. International roundtrip airfare from our Houston, Texas gateway. 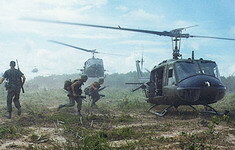 Why choose Vietnam Battlefield Tours? VBT - We use only highly-experienced U.S. Marine Corps & U.S. Army Vietnam Veteran guides. VBT - Runs 15-day tours which ensures unrushed touring. VBT - Has all-inclusive pricing. (Beware of hidden charges forced on you by other tour operators). VBT - Gets you to places other companies cannot access. VBT - Our tours are designed for customization based on participant's requests (no off-the-rack tours).